LNER passenger locomotives had always been painted Apple Green. But during the Second World War, Flying Scotsman was repainted in wartime black, in common with all railway stock. (We recently repainted it this colour temporarily.) After the war, it became green again, and was rebuilt as an A3 Pacific. In 1948, rail travel in Britain was nationalised with the formation of British Railways. Scotsman, now numbered 60103, was painted blue for a time, then BR Green. It remained in this colour until 1963, when it was retired by British Rail. By this time, it had undergone several alterations to improve its performance – but it had been pulling trains for 40 years, and steam engines were becoming old-fashioned. 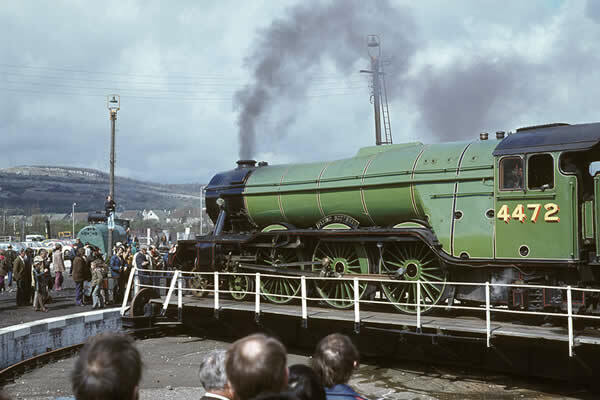 Flying Scotsman at Carnforth Lancashire in 1974. In January 1963 Alan Pegler bought Flying Scotsman. As part of the deal, Pegler negotiated a complete overhaul of the locomotive. It was converted back to single-chimney condition and repainted in London & North Eastern Railway livery. The tender was exchanged for a corridor type, and an agreement made that enabled it to run on the main line. In a blaze of publicity Flying Scotsman ran its last train for British Railways on 14 January 1963. In May 1968 on the 40th anniversary of the first non-stop run, Flying Scotsman travelled non-stop from London Kings Cross to Edinburgh. In 1969 Flying Scotsman headed for the United States on a tour intended to promote British exports. The tour broke even in its first year, but the second lost money. To try to balance the books Pegler arranged for the train to travel to San Francisco. The trip worked well operationally but was a financial disaster. Alan Pegler was forced into bankruptcy and for now at least, Scotsman was stranded in the USA. However, in 1973 Flying Scotsman was brought back to the UK after William McAlpine heard about the situation in the USA. He promptly put together a rescue plan, paying off the creditors and buying the locomotive. McAlpine had the engine restored at Derby Works and kept it running for 23 years in his ownership, extensively overhauling it twice. He even took Flying Scotsman to Australia, making it the first steam locomotive to circumnavigate the globe on its voyage there and back. While in Australia, in 1989 it also set a new record for the longest non-stop run by a steam locomotive at 442 miles. Following the successful tour of Australia, Flying Scotsman ran special trains around Britain including regular runs over the famous Settle to Carlisle Railway and trips hauling the prestigious Orient Express Pullman train. The locomotive was repaired again in the early 1990s at which time pop impresario Pete Waterman formed a short-lived partnership with Sir William to run the locomotive. In February 1996 businessman Tony Marchington bought Scotsman outright for £1.25 million. In 2004, Flying Scotsman hit the headlines again with yet another crisis over its ownership. A campaign spearheaded by National Railway Museum to save the locomotive for the nation amassed the support of thousands, confirming its status as a national treasure. From 2006, Flying Scotsman underwent an extensive restoration in the workshop of Riley & Son (E) Ltd. In 2016 the painstaking £4.2m project to bring the legend back to life, resplendent in its BR green livery in its guise as 60103, was completed. As the restoration process came to an end, all eyes were – once again – trained on the world’s most famous locomotive. The next chapter in the Flying Scotsman story was its triumphant return as a working museum exhibit, conquering yet another record as the oldest mainline working locomotive on Britain’s tracks. Undoubtedly one of the jewels in the crown of the museum’s world-class collection, it is now presented to a new generation of Scotsman fans captivating the public for generations to come. The appeal to keep the steam icon in Britain was supported by a £1.8 million grant from the National Heritage Memorial Fund and the generosity of the public. The restoration has also been undertaken with the help of a Heritage Lottery Fund grant of £275,000.